My first day's bead making left plenty of room for improvement. The good news is I have improved, though I'm still having some control issues. I can now make considerably larger beads that are generally round and don't have ugly "outies". This bead was my favorite from Day 2 - it was the last one I made that day. It's considerably larger than the others I'd made that day and the decoration turned out really well (for me at least). I've uploaded a few pictures to my new Flickr account as it seemed like that might be easier than sticking them all here. I've really had fun with the bead making, and like my results, even if they aren't perfectly symetrical. 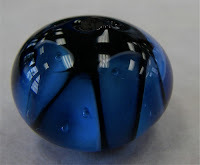 It's been really interesting to see what the different glass colors actually look like in a bead. So far, the dark transparents seem to work best for me as bead cores. When I try to use them in surface decoration, the dark amber and emerald green canes look almost black. Maybe they'd work better if I pulled stringers. You're supposed to use stringers to add the dots, but I currently have more control with the glass rods than with the finer stringers.